As Pittsburgh Theological Seminary prepares for a potentially smaller physical footprint, it’s also planning a more vibrant future. Strengthen the core, develop the edge—these are among the guiding principles that emerged from the recent comprehensive campus and facilities master planning efforts of Pittsburgh Theological Seminary (PTS), Pittsburgh, that will inform its next strategic plan. The catalyst for rethinking use of space has been twofold: changes in the PTS student population and in the seminary’s surrounding community. Gradually declining enrollment—from more than 350 students in the mid-2000s to a current head count of about 200—combined with demographic shifts toward more commuter and part-time students, has decreased the demand for student housing, notes James Downey, vice president for planning and institutional effectiveness. The city’s economic and population growth patterns are likewise raising new questions about how the seminary can use its campus assets to better serve its neighbors. The physical dimensions of the PTS campus span 13 acres. This may seem small in comparison to many higher education institutions, but it’s a decent amount of real estate within an urban environment, notes Downey. At the south end of its campus is the back of a Home Depot store, flanked by additional commercial and office spaces and some small high-rise buildings. Across the street at the north end of the seminary is a residential zone with single-family and duplex homes. “Part of any campus redesign will be trying to make our property flow along this trajectory,” says Downey. 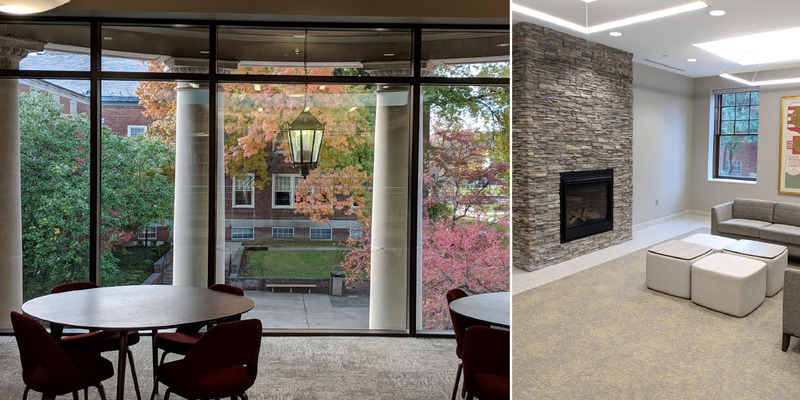 Pittsburgh Theological Seminary is infusing more daylight into its makeovers, as in the renovation of its Barbour Library. While PTS may have a smaller number of full-time students than other schools, it offers a broad array of continuing education opportunities that bring about 2,000 additional visitors to campus throughout the year. “Part of our thinking for our next strategic planning cycle is to consider becoming a more intentional venue for meetings and conferences and for public lectures,” says Downey. The seminary already hosts Pittsburgh’s fire and police academy graduations. Including a variety of lectures, meetings, and conferences, the seminary brings approximately 10,000 additional visitors to campus each year. The seminary’s growth targets transcend increasing enrollment numbers, says Downey. “Increasing energy and excitement on campus is a top goal.” In fact, the desire to infuse more activity into campus life gave rise to one of the seminary’s guiding principles for its space planning efforts—strengthening the seminary’s core. As part of their planning efforts, leaders conducted an exercise inviting students, faculty, and staff to reflect on spaces throughout the campus—every built structure and open green space—and document how they perceived those spaces in terms of their functionality and importance. Did they feel positive or negative about the space? The exercise pinpointed places on campus, both inside and outside, that resonated most strongly with the campus community, says Downey. “From that, we became focused on our core—not only the set of buildings, but also what is central to the student experience within and around those spaces that we want to enhance.” For instance, the exercise included assessing the importance of outdoor spaces to ensure any facilities changes would not eliminate those desirable quiet spaces away from foot traffic that are ideal for reflection and contemplation, says Downey. 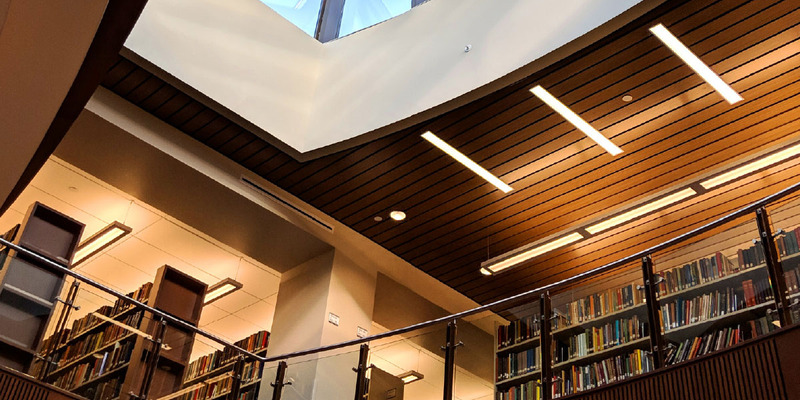 As a first step in strengthening its campus core, in fall 2018 PTS celebrated the grand opening of its $12 million gut-to-wall renovation of the seminary’s Barbour Library. The makeover entailed extensive planning for how to enhance use of space in a way that would compel people to engage within it. Make no mistake, the physical volumes of the seminary’s specialized collection in theology and church history—one of the largest such collections east of the Mississippi, notes Downey—are still central. Yet, as high on the list of priorities as preserving its heritage was creating a fully modern space that was inviting to the larger community. Beyond strengthening its core, the seminary is looking at creative ways to develop the edge of its campus. The question of how to increase direct engagement with the community has also raised the question for leaders of where to introduce more points of entry. One idea under discussion for making the seminary’s borders more open and welcoming is developing a green space for hosting a food truck or a local farmers market and art fair, says Downey. In initial planning meetings with community members, campus leaders asked how the seminary might contribute to the surrounding neighborhood. “One suggestion was to build a bus stop shelter on the edge of our campus for the benefit of not only our students but also local residents. It’s a great idea that we hadn’t thought of, and we will consider adding that as part of the plan,” says Downey. Pittsburgh Theological Seminary is remaking its spaces by adding appeal and inviting more activity on campus. “As we brainstorm future scenarios of campus life, taking a hard look at how we may need to strategically reduce our facilities in order to invigorate our mission has entailed first identifying our excess capacity and putting real numbers to that,” says Downey. “We realize that locking up dollars in square footage we don’t need would keep us from applying resources to revitalize or invest in things we do need,” he explains. This mindset has helped the seminary’s leadership identify roughly 25,000 square feet of capacity beyond current needs. The excess spans a little of everything, says Downey, including classrooms, meeting spaces, and a cafe nearly double the size it needs to be, located in the ground floor of the faculty office building. Among the decisions leaders will address in the next phase of the seminary’s strategic plan is how best to use five separate residential spaces on its campus, ranging from dormitory-style to two- and three-bedroom apartments. “Further analysis might suggest we divest from some properties or perhaps renovate them with a partner into workforce housing or affordable housing, while reserving enough space for our students,” says Downey. What is certain, says Downey, is that PTS’s strategic planning and campus master facilities planning efforts will each continue to inform the other as the seminary moves forward in revitalizing campus spaces and strengthening bonds with, and service to, its larger community. There are actual space shortages, and then there are perceived space shortages, says James Downey, vice president for planning and institutional effectiveness at Pittsburgh Theological Seminary. “When each group wants to hold its meeting on Tuesdays at 10 a.m., it creates an inevitable space squeeze. But, if one group is willing to meet at 2 p.m., you suddenly have enough space,” says Downey.